Ah, Tasmania! So much natural beauty everywhere you look. Perfectly crafted colourful landscapes as far as the eye can see. 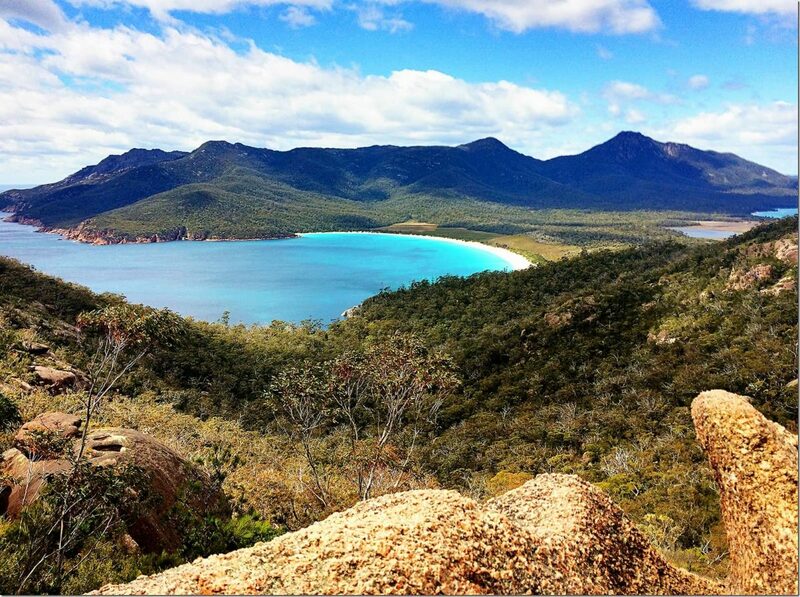 From flower covered hills to rugged granite peeks of the one and only Freycinet National Park. And what a sight! Our journey down the East Coast of Tasmania has taken us into numerous natural wonders of this amazing part of Australia. Freycinet National Park, apart from the Bay of Fires, was one of the ‘must see' places on our list for our Tasmania holiday. I am very happy to say that it was worth it! 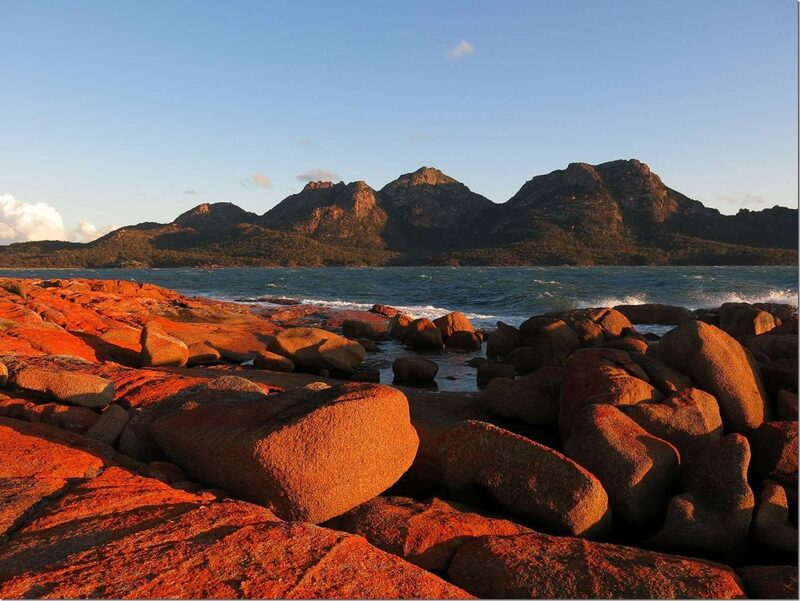 Both short and long Freycinet National Park walks are on offer, together with some spectacular lookouts, romantic beaches and some pretty cool camping and picnic areas too. It is a great destination for pretty much everybody! It is great for families with kids, for romantic couples and the tough hikers and adventurers at heart. It is also one of the best destinations for seniors who are visiting Tasmania. 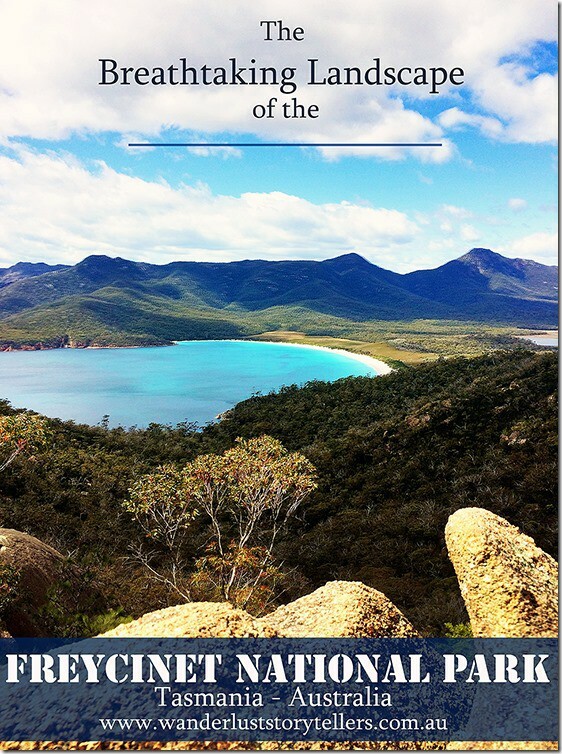 Keep reading to find some helpful tips as well as ideas on what to see whilst visiting Freycinet National Park. 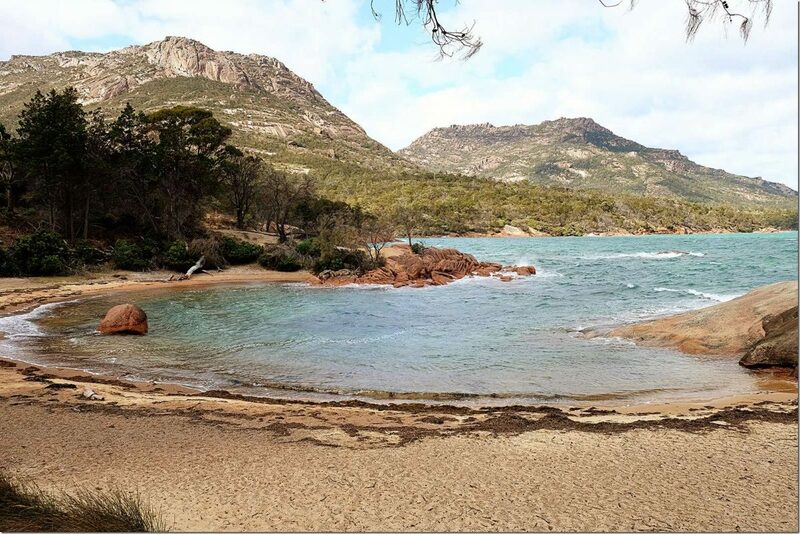 Our first stop on the list of things to do in Freycinet National Park was the famous and relaxing Friendly Beaches. Perfect place to stroll on the white sandy beaches for hours, holding hands and enjoying vast open space. Surfers taking on the waves, families swimming in the shallows and couples chilling out sunbathing. Say no more, relaxation and bliss guaranteed here. My gorgeous wife and I decided to park the car at the Isaacs Point to get a better look from the top, the view was incredible! The beaches stretch far and wide. White sandy beach together with the turquoise ocean is always a great play of colours for the wanderlusters' eyes! Who doesn’t like to see a lighthouse? Always positioned at the best vantage point with picturesque panoramic 360-degree views. 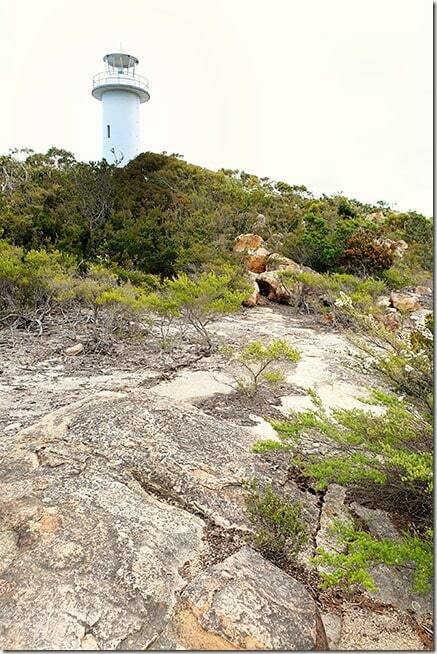 This 20 minute Freycinet walk will take you to the Cape Tourville lighthouse and back. It was pretty windy when we were here, so we recommend to have some sort of wind protection. As you see in most of our pics here, the hoodie was on pretty much all the time haha… Windy or not, it is still an amazing place to visit. It’s an easy walk and most of the path is on the lighthouse boardwalk with guardrails, but don’t let your little ones climb them. The sheer drop down the rugged cliff face is quite something. Absolutely amazing to take pictures of, but wouldn’t want to see it up close. Definitely one of the more spectacular of the Tasmanian lighthouses. We are hopeless romantics at heart and even hearing the name Honeymoon Bay, we knew it is a place we needed to visit. And yes, it is a most romantic little hideaway for both those like-minded people or not. Here you will find yourself peacefully secluded and on a sunny day, you can feel like you are in your own private piece of paradise. On our trip, however, we found this picture perfect gorgeous bay quite windy, the water was pretty choppy and not as clear as we were hoping to find! 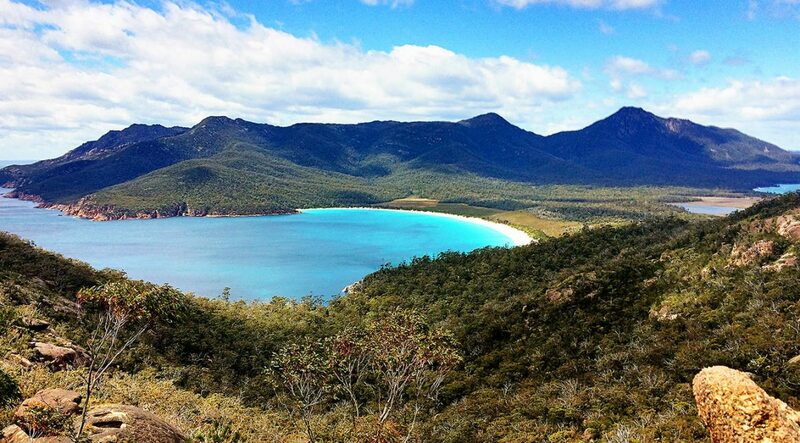 Perhaps on another trip to the amazing Freycinet National Park, we will stay here a little longer. Picnic blanket, strawberries and something refreshing to drink… Sounds quite relaxing, doesn’t it? There is also a Honeymoon Bay campsite close by for those who love to connect with nature more closely! Now we are getting to something more of what I like. I love the picture-perfect white sandy beaches and crystal clear peaceful water, which together creates a picture of peace and tranquillity in your heart. But I also love something different. How many rocky beaches have you been to? 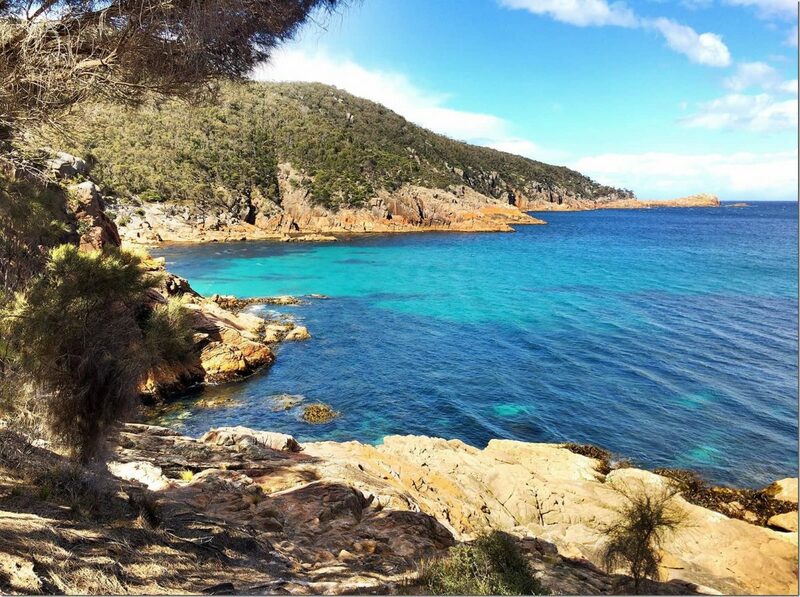 Sleepy Bay and Gravelly Beach is, I think, my favourite walk in the Freycinet National Park. The walk will take you 10 minutes or 30 turnarounds, depends on if you take it all the way to the southern end. It’s a cool little hike. It will take you past few great East-Coast lookouts for some perfect picture opportunities, but at the end, you will find the most rewarding view. As soon as I saw the giant boulders with a “pac-man-like” cave in one of them, I knew I had to get to the top and tick that one off in my memory bank. Watch your step on the way up. I took the harder way up from the right side of the “pac-man” cave and made my way down all the way on the left side of the rocky wall, which was much easier. Either way, if you get to the top like me or enjoy the view from your personal rocky spot on the bottom of the beach, you will enjoy one spectacular view. I think we spent about an hour here, just relaxing and taking in the surroundings. The walk to Wineglass Bay walk to the lookout took us about 1.5 hours return. This walk is a bit steeper. The climb up takes you on a rough and rugged bush walk about 1.5km each way. Yes, it may take you a little longer, but trust me, you will love it! The first lookout we got to presented us with a view over the extraordinary Coles Bay, located on the West side of the Freycinet National Park. 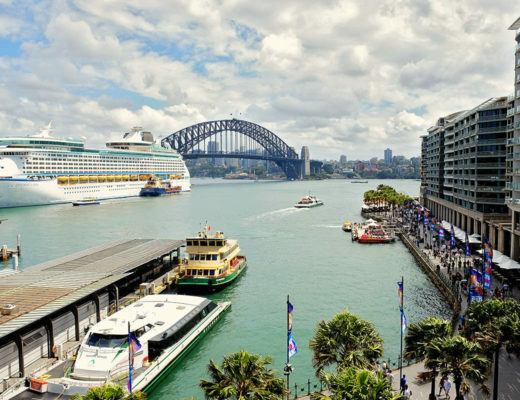 When you finally get to the lookout, the magnificent view awaits you in its whole glory! I obviously had to climb some rocks, so I jumped the fence and got on one to the left of the secure viewing platform. I think there were at least 30 people enjoying the scenery from every corner of the lookout and everyone with smiles on their faces. Little tip: make sure to hang around and wait for the sun to shine on the Wineglass Bay beach, so you can see the true colours emerge. Later in the afternoon, my gorgeous wife asked me to take this pic. While she sat in a warm car protected from the cool wind, I skipped and jumped down to the rocky shore to get a better view of The Hazards. We wanted to capture the beauty of The Hazards range in the afternoon light. The four granite mountains that form the range (from West: Mayson, Amos, Dove and Parsons), are covered with pink feldspar, which in the sunrise and sunset give your eyes a pink playful glow. Not easily captured in the camera lenses, especially when you are balancing on a wet rock in the Tasmanian afternoon wind. Hmm, nice to be in the car too, but then we wouldn’t have that photo! Tip: a good spot to take this photo is from Pirates Point at Muirs Beach. 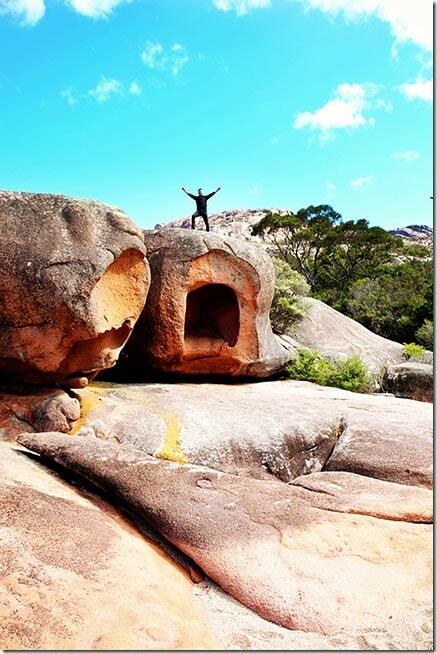 Which of the Freycinet National Park attractions caught your eye? 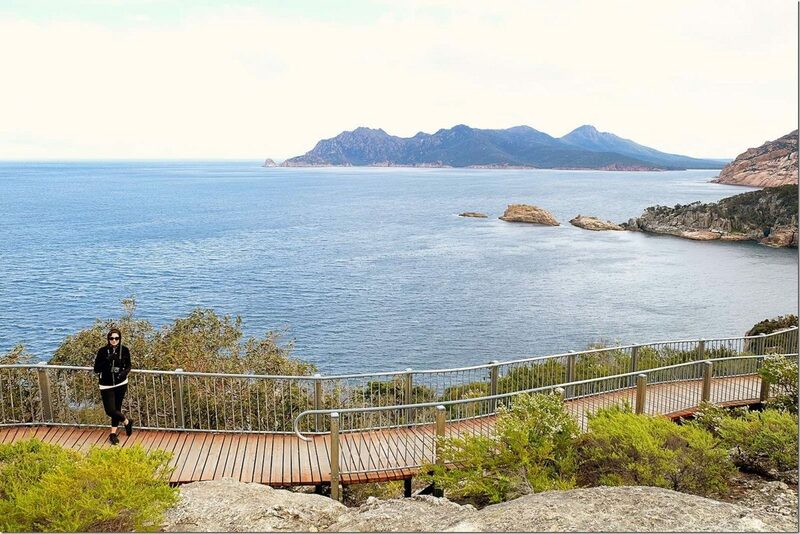 Which Freycinet Walk do you want to go on? PLEASE PIN OUR PIN. Thank you. Other options are available for holiday, annual or two year passes here. 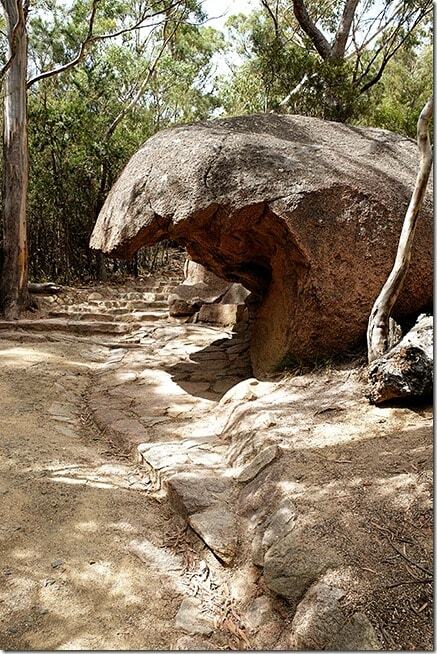 The 3 day walking experience has been carefully designed to experience all of Freycinet Peninsula Circuit Walk, without the need to camp overnight in the park. 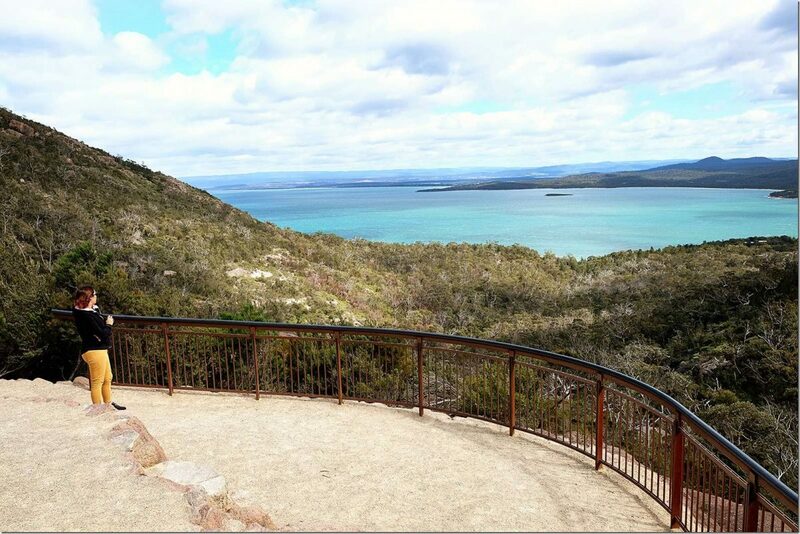 Experience spectacular views from the top of Mt Graham over the entire Freycinet National Park. 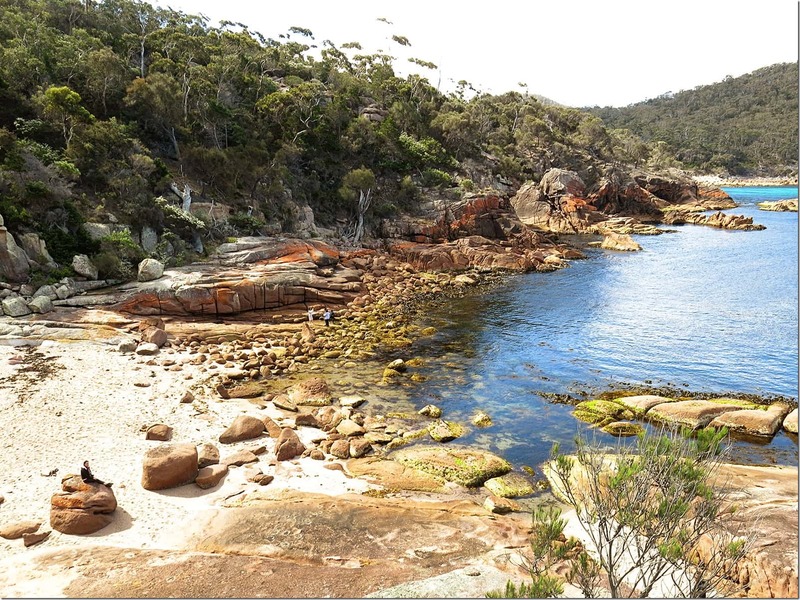 Cooks Beach to Mt Graham is normally only accessible by camping overnight in the park, however on this walking tour, we will join our boat and cruise to Cooks Beach. 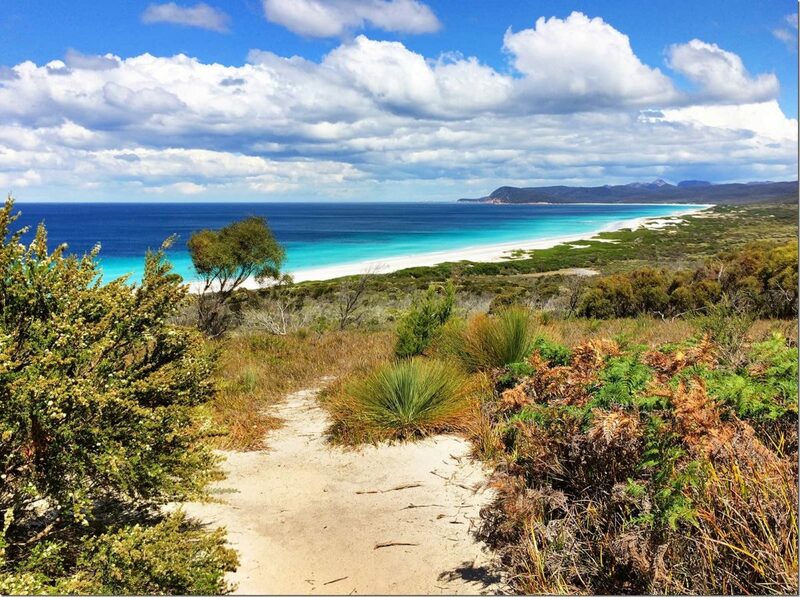 From here we can walk over the top of Mt Graham, for magnificent views over the entire National Park, before descending to the famous white quartz sands of stunning Wineglass Bay. 2 nights in Deluxe Spa Cabins, Freycinet Lodge is included. Find more information on this walking tour on the Life's an Adventure site here. For a popular Freycinet luxury accommodation option, look no further than the 5 star Saffire Freycinet Resort. Featuring a Jacuzzi, private terrace and elegant accommodation, the views from this resort is simply breathtaking! Check out the latest prices and more details here. Our recommendation of where to stay is at the Edge of the Bay Resort. These Freycinet beach apartments offer gorgeous views over the Hazards. Boasting a private beach, Edge of the Bay is located in Coles Bay and offers comfortable accommodation. Located in Coles Bay, Freycinet Lodge offers luxury 4-star accommodation, as well as outdoor tennis courts. The views from some of the rooms at this lodge are simply to die for!! Check out the latest prices and more details here. For cheap Freycinet accommodation, book yourself a cabin at BIG4 Iluka Coles Bay. This affordable option is ideally located for those wishing to visit the area's popular attractions. Check out the latest prices and more details here. 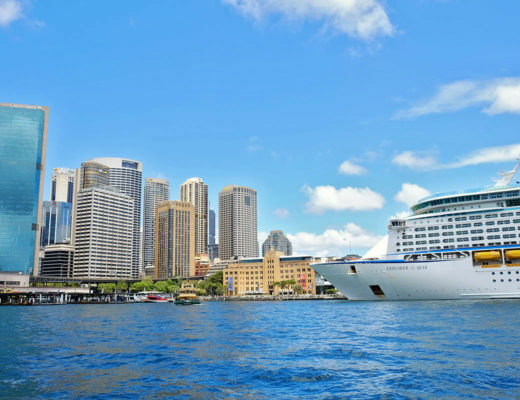 After some Essential tips before you travel to Tasmania? Click to read one of our most popular posts containing bucket-loads of tips and hints of how to prepare for Tasmania! Wondering where we personally Stayed in on our Road trip through Tasmania? Check out our list of where we stayed throughout Tasmania here! 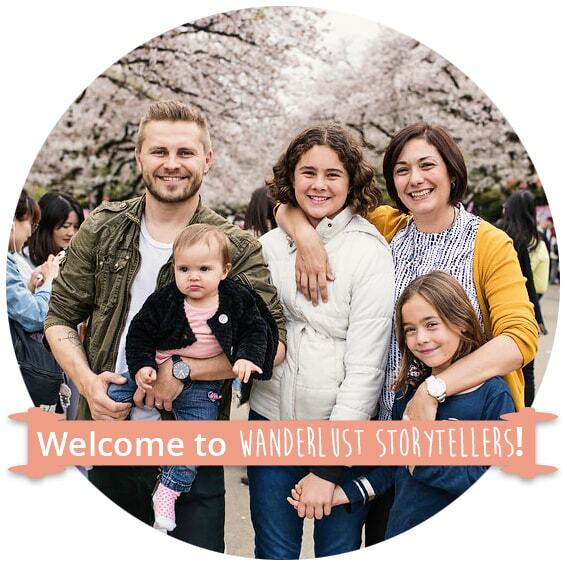 After stories about our travels to Tasmania? Click to read the comprehensive, informative stories of our travels through Tasmania! 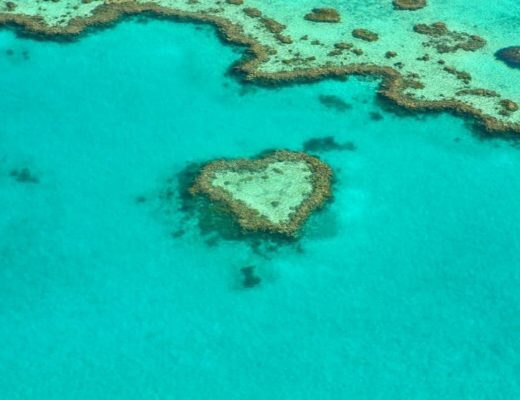 4 Destinations that you Should see When Visiting Queensland, Australia!